I have never had a cell phone plan. I pay about $20 a YEAR to use my cell phone. I always try to explain how it is I do this, and recently my friend suggested I do a tutorial on it. So here it is! Sign in to The Google Voice website. You can use your Gmail credentials to log in, or if you don't have Gmail (you should) you can sign up for an account. Once you are logged in to Google voice for the first time, it will ask you to choose a number. It is probably easiest just to type in the area code you would like. Step 2 - Have phone calls forwarded to Google chat. Go to Gmail and click on the Call phone button. If you have not yet done this, it will install a plugin for your computer. Now you are set up to make and receive phone calls. Make sure that you computer has working speakers and microphone. To make calls - In Gmail, simply press your Call phone button, and dial the phone number you wish to call. Your Google Voice number will show up on the caller ID for the line you just called. To receive calls - Have Gmail open and have someone call your Google voice number. The best way to do this would be to get a Google Android phone. This allows you to make phone calls using Wi-Fi. Let Sipdroid sign you up with a PBXes account. With Sipdroid on and connected to a Wi-fi connection, you will now receive calls when people call your Google voice number. Calling out can be trickier; I have had various luck calling out with Sipdroid. The most reliable method for this to work is to log into Google Voice on a computer and dialing the number you wish to call and have Google voice dial your Google chat account. 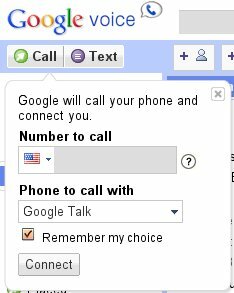 Have Phone to call with set to Google Talk and it will call Gmail (if you have it open) or Sipdroid. One thing to make this work better for you is to update your Google contacts with phone numbers. Update each contact with their phone number if this is not already done. This will making calling in Google Voice or Gmail easy, as you just have to type in the contact name. If you have a phone with Android, your contacts will be automatically added to your phone with their number. For me, I have Wi-fi at home, work and school. Many public places have free Wi-fi. I also don't like talking on the phone in the car. There are a few occasions though where I am in areas where I have no Wi-fi access and I need to contact others (like while I am hiking, or meeting people in areas with no Wi-fi). For this, I purchased a T-Mobile pay as you go phone. It was cheap. I took the sim card out and put it in my Android phone. T-Mobile has a plan where you only have to pay $10 at a time and you get about 25 minutes for that. The plan is pretty expensive, but if you only use it when you need to, it is not bad at all. Typically, I only have to add 10 - 30 dollars a year. You can get Android phone unlocked used and relatively cheap online (try eBay or craigslist). But if you don't want to get an Android phone, you can use other Wi-fi phones with various success (but probably a lot more work). Many phones will allow you to install the program Fring. You can use this with a Gizmo5 account. If you have a phone with no Wi-fi, you can still use Google voice; just get the cheapest plan possible. Use Google voice for texting and phone calls when you can and avoid using minutes on your phone. Get Google Voice even if you don't have a phone with Wi-fi. The voicemail options alone make it worth it. You don't have to worry about which texts or voicemail messages to delete because Google Voice will save them all. Give people your Google Voice number and only use this number. This is the hardest thing for most people, but this is what makes it really worth it in the long run. It might take a while for this to happen. Whenever people ask for your number, just give them your Google Voice number and only use this number to call others. Eventually if this is the only number you use, people will stop using your old number. Accept the reality that this is geeky and saving hundreds of dollars might not allow you to talk on the phone all of the time. This is probably more for people who don't have to be tied to their phone all of the time. No doubt roaming charges always leads to bill shock. Expenses on cell phone are generally expected higher when using outside a normal calling area. To avoid such expenses, it’s better to download a free app like skype, viber etc. which allows free phone calls and text messages. However, to use such service both parties should have the same app on their device and require internet data packages too. Fortunately, now we have one more app called Roamer that helps you making international calls without any roaming charges. The app keeps you connected with the regular numbers and prevents the shock of phone bills while roaming.